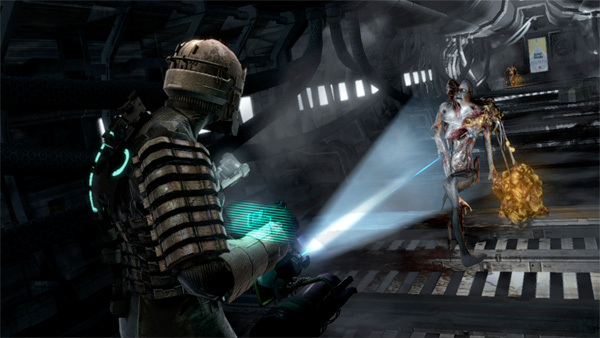 The original Dead Space was fecking awesome. It’s as simple as that. It was scary, actiony, beautiful, and enthralling. All the things I like to see in a survival horror video game to keep it well balanced and myself interested. This is why I wasn’t so impressed by Resident Evil 5, because the fear factor just wasn’t there in the slightest. This made it a great co-op action game, but hardly anything scary in the least. Dead Space nailed the horror for me, and because of that, it will always go down as one of my favourite games ever. Now that a sequel is out, my thirst for survival horror action – in space – has again been quenched, and I have put myself through a good few hours already of nail-biting, ammo-conserving, body-stamping, spike-shooting, eye-gouging terror, whilst enjoying the outstanding animations and sights to see in the world – or rather ship – of the Sprawl, the largest human space station known to man (in the universe of Dead Space, of course). Isaac is back, but so are those dastardly necromorphs, the utterly horrific mutant beings that want nothing more than to rip the eyes, heads, arms, legs, and guts out of everything and everyone in sight, the only difference is, this time there are more of them, and they seriously aren’t messing around. Newer ones, faster ones, meaner ones, bigger ones, and older ones that are just plain faster, meaner, and bigger. No matter which one you come across, they still all just want to tear your face off or, failing that, spew up acid vomit all over it. I don’t want to say too much about it yet, as I’m not finished, but watch this space for a full review soon enough. 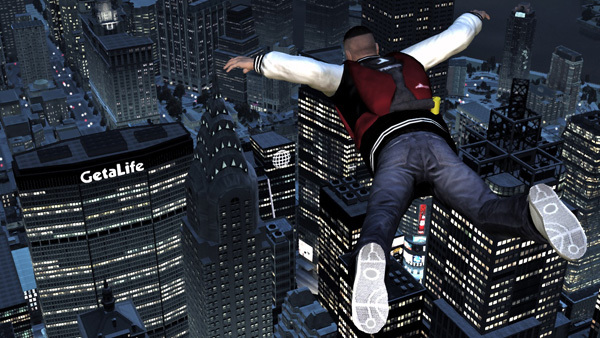 GTA IV was one of my favourite sandbox games ever. When I first turned the game on, my mind was blown by the astounding physics engine and the incredibly fluid and realistic way that people, well, bounced off your car bonnet in a high speed chase, when you accidentally plough into a crowd of people carrying shopping. Don’t worry though, if you never played GTA 4 (in which case you may be old) it’s not quite as offensive or horrifying as it sounds. The way it was done was always hilarious somehow, and the physics just made everything so funny that you never felt bad about anything, yet the storyline itself contained some really emotional parts that impressively manage to make you empathize with certain characters, especially when bad things start to happen to everybody (it’s Grand Theft Auto, what do you expect). I started playing the last episode to be released for GTA 4, and so far it’s been pretty cool. You play as Luis Lopez, a latin-american entrepreneur running a chain of night-clubs with your friend, camp-as-a-row-of-tents Gay Tony. The story is nothing special so far, but it’s brought a good few laughs; especially when things escalate in a ridiculous fashion, where you might be doing a simple cocaine trade mission in a back garden somewhere, and then suddenly you are fighting your way through the full might of the entire city’s police force. All in a day’s work for a GTA character! Admittedly, the only things new about it are the characters, the new guns, and the new parallel-to-Nico-Bellik story that’s going on. There’s a neat amount of cool stuff to do, but to be honest so far it’s all just been superficial. 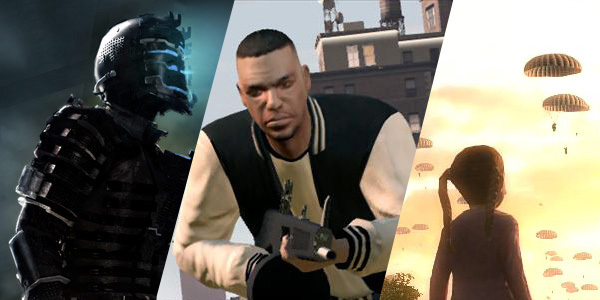 The inclusion of a couple of new mini-games are kind of cool, but in truth they aren’t really anything amazing to have been added to the already fairly empty world (in terms of distractions) of GTA IV. It never stopped me loving the game and its story though, so I’ll definitely be making an effort to finish the story of this one. I saw World in Conflict including the Soviet Assault expansion in the shop for only £3.99 the other day while I was grabbing Dead Space 2, so how could I refuse to pick it up? I’ve never played before yesterday, and though it’s now kind of old, it’s clearly still absolutely awesome. I love a good strategy game, and this one definitely gets a lot of things right. It’s huge scale combat with brilliant camera angles that allow you to see the battle from really high up, or even right down at the same level as the soldiers running around in the streets. The level of detail is incredible, and this is especially the case when it comes to destruction effects, explosions/smoke etc. Watching a barrage of heavy artillery rain down on a patch of targets is a beautiful sight, and seeing all the rubble, shrapnel, and bodies come flying out in every direction amidst an amazingly detailed cloud of dust and smoke. 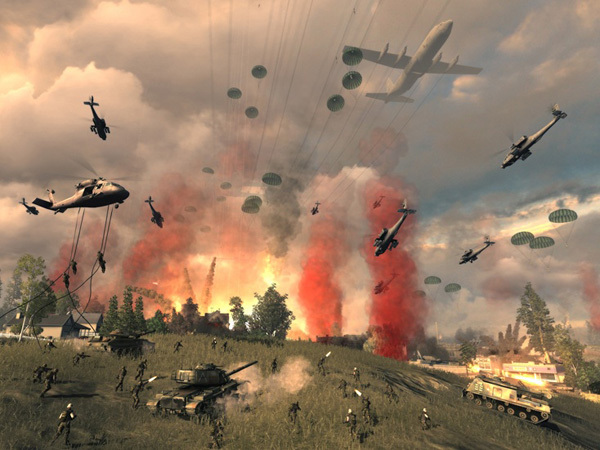 It’s like a cross between Company of Heroes and Tom Clancy’s End War. I loves it, and I’m going to be playing a lot of it. Bring on the tactical nukes!!! This entry was posted in Thoughts and tagged currently playing, dead space 2, GTA IV: The Ballad of Gay Tony, World in Conflict. Bookmark the permalink.